Firewood racks are one of the best ways to store your firewood for the old winter months. These racks are usually robust and keep firewood in an organized indoor space without taking a lot of space. The perfect arrangement allows for several pieces of woods to be stored in a dry and aired place. This way, you can easily find them in the best dry quality ready for use. While there are several firewood designs and shapes, you need to select one that suits your needs. 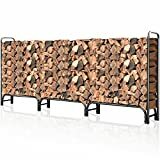 Choosing the best firewood racks requires an understanding of your firewood needs, types of firewood to store and budget. In this post, we’ve reviewed some of the leading firewood racks on the market to buy. These are the best-rated racks with robust construction and long-lasting durability. Choose from our picks below to get the best value for your money. The Landmann firewood rack is a neat design that allows for perfect arrangement of firewood off the ground. This raised arrangement keeps the firewood protected from water, moist and dampness. It is an adjustable rack up to 16 feet wide to enable storage of small and large pieces of wood. The finish of the rack is a black weatherproof powder coat to offer maximum protection from the weather elements. The Shelter Logic is another solid construction firewood shelter with a raised base to keep the wood off the damp ground. This way, the rack eliminates bugs, moisture, and mold growing on the racks. It is durable all-steel frame construction with an easy assembly. The finish is a black powder coat to prevent corrosion and rust. You also get a two-way adjustable cover that is 24-inches long to cover the entire rack at the top. The Panacea firewood log is a unique circular design with a 40-inch long hoop to store the firewood. It is a perfect choice when you want to display, store or dry firewood with easy access from both sides. The steel frame construction is powder coated to prevent rust and corrosion. The rack keeps the firewood dry a distance from the ground. The Sunnydaze is more versatile firewood and kindling holder measuring 48-inches long and 30.5 inches. The rack weighs 20 pounds and can hold several pieces of wood with ease. The construction of the rack is powder coated still for durability. There is a further removable kindling holder at the top that is easily adjustable to match your kindling size. You also get a one-year manufacturer’s warranty. The Woodhaven firewood rack is a high-quality product proudly made in the United States to the highest standards. It is a steel construction rack with a beautiful black powder coated finish. This finish is environmentally friendly and will not cause any pollution. It also comes with a large cover that easily adjusts with the amount of wood in storage. It covers a large 12-inch wood keeping them dry and free from rain. Overall, this is an excellent rack with arc welded end sections. 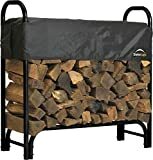 The GoPlus is a heavy duty firewood rack with a unique design to give you easy access to the logs both outdoors and indoors. It is a heavy duty steel construction with a black powder coating to prevent rust and corrosion. The rack raises your wood a distance from the ground keeping them dry and safe for the cold winter season. The assembly is also pretty easy. 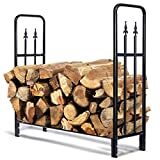 This is a long 12 feet heavy duty firewood rack ideal for use near the fireplace. The rack measures 143 by 48 by 14 inches with another 6.7 inches off the ground to keep the firewood dry. You can easily store up to 1.5 face cord firewood perfectly. The tubular steel construction is powder coated and rust-free. It will keep the wood safely and serve you for an extended period offering long-term durability. The assembly of the rack is also pretty easy with 16 screws, 4 cross bars, and 8 metal pipes. This coupled with a one-year warranty makes this a fantastic rack for any home. 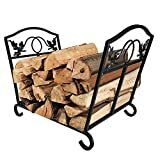 This is a simple firewood rack for fireplaces and one of the best picks for indoor wood storage. The rack is heavily constructed using and painted with a powder coat to prevent rust. This is a Canada made the rack with a great design to fit almost all types of wood. It is a modern rustic design suitable for both indoor and outdoor use. The assembly is easy with all accessories included. The Woodhaven is an excellent 5-foot firewood rack with top craftsmanship. The rack is made in the USA with a durable stainless steel metal construction and a baked black powder finish. The edge sections of the rack are welded for safety. It comes with a large cover to shield the woods from rain, snow, and other elements outdoors or indoors. The cover gives large 12-inch coverage on the top. 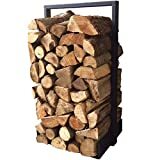 This is more of a firewood holder rather than a rack with a wide 21.5 inches at the top and 15.5 inches at the bottom. It safely stacks woods from small sizes to larger ones with guard rail protection on two sides to keep them in place. The leaf design decoration looks beautiful ideal for both indoor and outdoor use. This is a modern design firewood rack with a powder coated finish. It can hold enough firewood to get you through winter with ease. It is stable and stands firmly giving you safe storage. The assembly is also easy making it an excellent buy. You also get a one-year for the indoor firewood holder. It is time you stored your firewood in an organized and safe manner for use during winter by ordering one of the above racks. 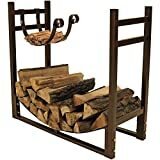 These are the best firewood racks on the market with durable construction for long-lasting use.